The picture of Holly Fisher below and one showing it side-by-side with a Muslim terrorist in an eerily similar pose have been making the rounds. In the last few days, I've seen them both on Twitter more times than I can count. Although the two images side-by-side, usually accompanied with a challenge to the conservative Christians championing this image to "explain the difference" seems to be more popular among those I follow on Twitter, I like this one better. It seems to stand on its own, presenting what might be considered an idealized version of Christian extremism in the United States. Hemant Mehta (Friendly Atheist) recently took up the challenge of explaining what the image above means to him. The fact is, when I look at Holly, I don’t feel safe. I don’t know her. I don’t know how she interprets certain passages in her holy book. I don’t know how safely she handles guns. I don’t know how easily provoked she gets. I don’t know how she acts around atheists. The only thing she has going for her is that she resembles all those other right-wingers who, at worst, believe and say idiotic things but don’t necessarily resort to violence. But if I didn’t live in this country, then how the hell would I know that? Not to mention that if the best thing conservatives can say is, “At least Holly won’t kill you,” that’s hardly a compliment. He goes on to explain why the difference between this image and the one of the Muslim terrorist strikes him as rather small. But I want to set that aside and focus on what he said about the single image of Holy. I share Hemant's thoughts on this image, with the key point being that I find nothing safe about it either. Yes, I'll admit that the pose and what it reminds me of likely have something to do with this impression. Standing in front of a flag, with an riffle in one hand and a "holy" book in the other is the classic jihadist pose we have seen in several images and videos from Muslim extremists. This may be part of why I have the reaction I do. 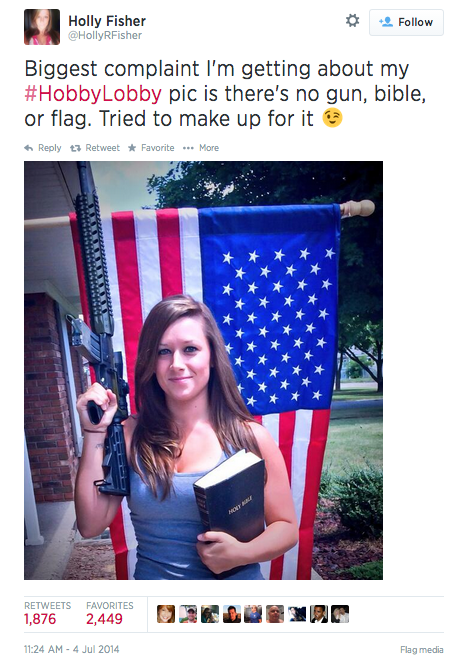 The critical point here is that neither the particular flag behind Holly nor her choice of "holy" book makes the image any less threatening to me. As Hemant notes, we don't know Holly. She may be a wonderful person, but that certainly is not what this image conveys. What we have to go on is what we see here: Christian extremism. And based on what we see here, I perceive threat. I know what Holly's bible says about those of us who do not share her faith and many other subjects. I also know that Christian extremism has been detrimental to those of us who live in the United States and who have been affected by the policies our leaders enact. And of course, I know that there have been acts of Christian terrorism in our recent history that have resulted in the loss of life. I have received more than enough threats over the years from Christians to have a general idea of how some of them would treat atheists if they were reasonably confident that they could escape punishment. Just look at how some Christians treat people who stand up for church-state separation! I have heard far too many disparaging comments about atheists from Christians to be naive about what some think of us. Poll after poll has suggested that these negative attitudes are widespread. In all likelihood, history is an excellent guide for how Christians would treat atheists if they had the law on their side. That is certainly not encouraging. Now, none of this necessarily means that Holly is a Christian extremist or that she wants to harm atheists. I have little reason to think that she was even thinking about atheists when she posed for this photo. That's not my point here. Her intent has little relevance to the question of what the photo communicates to many atheists. And like Hemant explained, what it communicates is not positive.